There are several varieties of masonic coins/tokens. Almost all masonic tokens will fall into one of the following categories - A token celebrating a particular mason, lodge or event, an initiaion token showing when you were initiated, passed and raised and finally the mark mason token which has ceremonial significance. One last category having only one member from the masonic family, is currency. 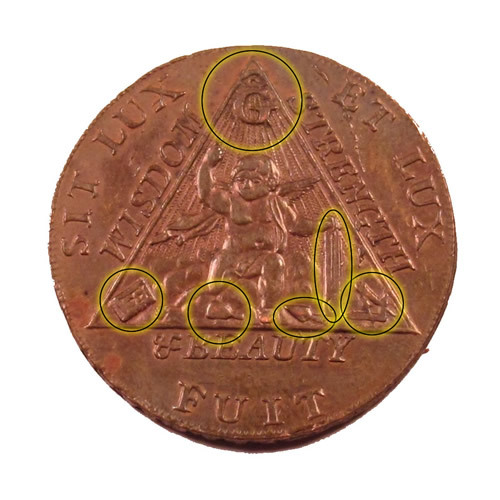 In the late 18th century, Brother Sketchly over in England minted the first and only masonic currency. 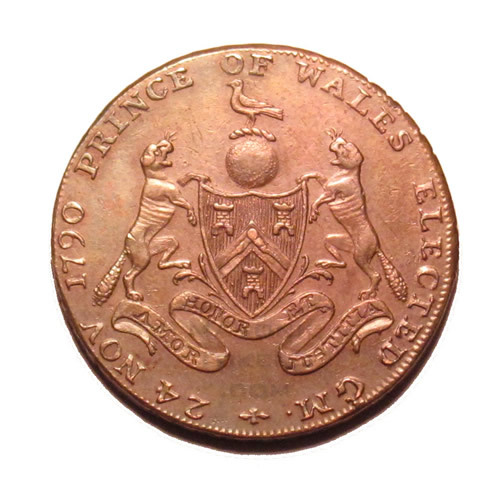 It took the form of a 28mm copper coin and was accepted as currency throughout the entire british empire, which at the time was most of the world. I've collected quite a few of these and have started cataloging them for online reference. There are three variations of this symbol, this is the first with there being no dot next to Beauty of Fuit. This variation features solid rays coming down from the all seeing eye. This variation with a dot next to Fuit features dotted rays. There are two variations of the reverse of this coin, one has a comma after NOV with no ribs on the beavers, the other with no comma and ribs. Having a dot next to both Fuit and Beauty the third variation has alternating solid and dotted rays. Portrait of George, Prince of Wales (Later King George IV) who was elected Grand Master of the Grand Lodge of England in 1794. Profile of George, Prince of Wales. Profile of Fred, Duke of York. There are two variations of the reverse of this coin, the first is the same as the others. The second has a different symbol at the very bottom. Notice the Compass inside Square within crest. The crest is the emblem of the Grand Lodge of England as well as the official emblem of Brother Sketchley's lodge (Adopted about 10 years prior to minting). The beavers on either side represent industry as they methodically construct large damns. Ebay buyers beware: There are a number of fakes floating around now and even high feedback ebay coin dealers are in some cases mistakenly selling them as authenic.